Stay, Illusion! 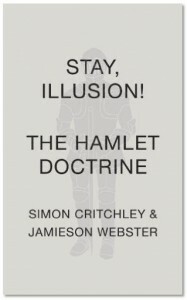 is a series of short (often very short) essays with an emphasis on developing a psychoanalytic and philosophical context for the world’s most famous play, Hamlet. The thrust of the authors’ reflection here is not literary appreciation or even literary criticism but to develop a “philo-analytic” (my term) doctrine to contextualize the overwrought psyche of Prince Hamlet. This is not surprising as the authors are the husband and wife team Professor Critchley, a philosopher, and Dr Jamieson, a psychoanalyst. In this process the authors succeed. Stay, Illusion! is not a graceful gavotte but a gallop through the fields of thought familiar to them and reined in by an almost whimsical tethering of their associative processes to specific references to the play. Riders who accompany them throughout the book are among the great modern philosophers and psychoanalysts such as Carl Schmitt, Walter Benjamin, Freud, Lacan, Nietzsche, Hegel, Melville, and Joyce, and others referenced, who happen to have written, mostly briefly, about Hamlet. 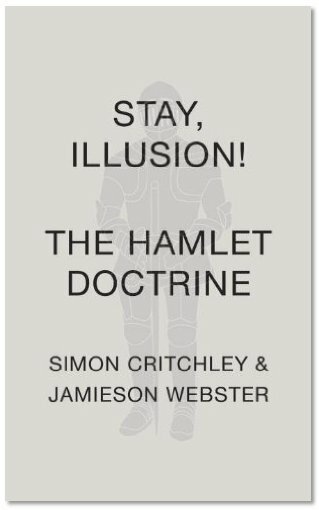 In Part 1, this wild ride takes readers through a brief but exhilarating summation of some of the major motifs in the play including the question: Why, for Hamlet, does thinking replace doing? So then, why write the book? Are these but two erudite Hamlet buffs writing a fan letter to the Bard? Are they strutting their “stuff,” the result of many a dinner conversation and Sunday afternoon talk, as they walk over the English countryside? Obviously Prof. Critchley and Dr. Webster can write; their prose sweeps the reader along. But who are these readers? Shakespearean scholars (I number myself among them) will find this book adds nothing to their understanding of the text that has not been said before. In fact there is a utilitarian and facile quality to what lines of text the authors chose to quote—lines not to nudge the book toward a Hamlet doctrine—but to force fit the text to the philosophical and psychoanalytical doctrines of others. Perhaps these are unfair questions to ask—the book entertains, refracts some new perspectives—and like the play remains illusive, enigmatic, forever out of reach. A disclaimer: I teach and have taught the play Hamlet for over 25 years. Hamlet is the prototype modern Western man, filled with nihilistic angst and anxiety, neurosis and mad obsession. The text, I believe, is all we need to try to understand this provocative and evocative young man. Hamlet, the character, broke the mold of Elizabethan heroes of “the theater of revenge” and as such freed Shakespeare to stand (even now) head and shoulders above the great modern philosophers and psychoanalysts such as those referenced in this book. Secondary sources abound in hundreds of books and thousands of theses and academic articles on Hamlet. But let the primary source “the play’s the thing” speak for itself. Hamlet defies doctrines; and fortunately we do not need anything else. Janet Levine is an author of four books and a freelance journalist with decades of writing under her belt. Her book The Enneagram Intelligences: Understanding Personality for Effective Teaching and Learning, focuses on the impact of personality on education in both teaching and learning styles.